Need more than a few cans? Buy a case of 12 (#12291202) and save! Boil noodles in beef broth. Mix in beef, salt and pepper. Top with parsley and serve warm. Very good product. Very little salt which is very much apprecited. Good flavor, makes wonderful stew or beef sandwiches. Will try with noodles in the future. Husband loves this meat and very reasonably priced. Will be trying the Turkey next order... Thank you Lehmans. After this past, very harsh, winter and several power outages our family decided to expand our preparedness plan to include meat. I decided to try a couple varieties of the Canned Meats. While it was very salty and did not contain as much meat as I had hoped I felt it wasn't awful. It is extremely expensive though. The cost comes out to $14.60 per pound of stew meat (and the can wasn't full). I figure our resources would be better spent purchasing a pressure canner and doing it ourselves. Versatile and very little fat. Purchased one can as a trial and the canned beef passed in flying colors. We made beef and noodles and my pickiest eaters ate the most! As my folks are no longer able to home can this addition to their pantry adds a sense of security as well as a delicious staple to have on hand. As a CSR I get questions as to if the meat was any good.So I purchased one and made beef and noodles. The beef is tender, tasty and with very little fat on top. You will enjoy it. This is a wonderful product to have on hand...very tender and flavorful! Just the right amount of beef and broth for a large pot of beef stew or vegetable beef soup. We bought a case. We will definitely be buying this beef again! We like this beef very much!! It's easy to use.I bought a case. I made beef soup with one can of this good flavored meat and plan to make pot roast with another can without all the time needed to simmer meat. The canned chicken too is good flavored although I found it splintered apart a bit much; both are convenient time-savers. Can was not fully packed as I had expected. But the meat was very good and the liquid added to gravy made the gravy even better tasting. I used about 1/2 a can of the meat to make a beef stew and it was excellent. Makes a good meal for when one is in a hurry. After all the rave reviews, I finally broke down and bought one can to try. I am extremely glad that I only bought one can, though. I seldom ever cook with salt or add salt to my food, and this was way too salty for my taste...not to mention my health. I found that there really is only a little bit less than 1/2 can of actual meat, making this super expensive and it's really not a good value for the money it costs. However, if I were starving, I might consider giving this another go (provided that I have plenty of water to flush out the heavy salt content). It did, however, get me thinking about canning and preserving my own meats and veggies. For that, I am grateful and am moving forward with that endeavor. Thank you for that. My wife and I tried the canned beef. 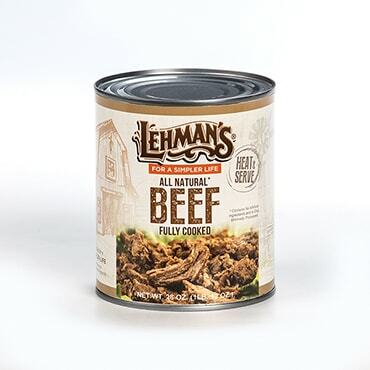 After the first delicious bite, it reminded us of my Mom's canned beef that she was so proud to have learned how to do on her parents SouthWestern Wisconsin farm in the 1930's. It is a nice taste from the past and to recall the fond memories of my Mom's canned beef. My Dad used to say, it was always a good time for a warm canned beef sandwich on a cold winter day!